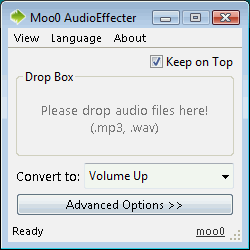 Moo0 Audio Effect lets you easily convert audio files into the ones with simple effects. The effect includes volume adjustment and detailed adjustment of each tone range. 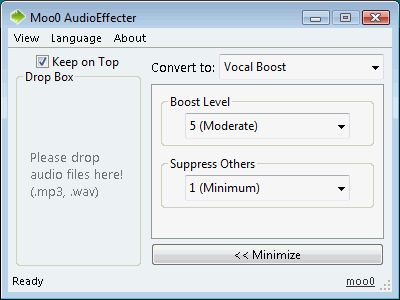 Also, it includes enhancement of vocal and instrument sound, although it is still experimental. French (Revision) support was made possible by R.Chabloz. Thanks really a lot!! (Symptom of 1.04) Applied effects differ from selected ones. It was a clear bug. - (24 Sep): Fixed since Version 1.05. (Symptom of old versions) Wave file sounds like donald duck on helium. It was a bug on Monaural/Low Sample Rate wave format files. - (24 Sep): Fixed since Version 1.05.